I am always on the lookout for useful methods to sample or partition study areas (usually in the form of raster datasets) into smaller units. 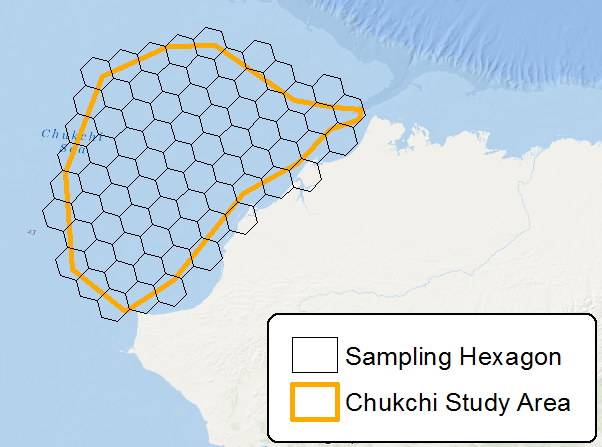 Recently, I read an ESRI blog post about a new tool for creating sampling hexagons. Although the hexagons are an eye catcher, my first thought is that they are more complicated and contain more vertices than, for example, a fishnet grid which could accomplish the same goals. What are the benefits of working with hexagonal grids over rectangular grids for study area sampling or partitioning raster datasets? The idea with hexagons is to reduce sampling bias from edge effects of the grid shape, which is related to high perimeter:area ratios. A circle is the lowest ratio, but cannot form a continuous grid, and hexagons are the closest shape to a circle that can still form a grid. Also, if you are working over a larger area, a square grid will suffer more from distortion due to curvature than shapes like hexagons. This paper (Birch, 2007) also presents a thorough comparison of rectangular and hexagonal grids for ecological applications, showing how hexagonal grids are preferable when issues of connectivity, nearest neighbourhood or movement paths are crucial aspects to be considered in the analysis. One of the benefits, that I've seen when doing wildlife or habitat modelling especially, is that hexagons allow patterns in the data (ex, edge of a field or any other patch) to be seen more easily than what squares would of offered. Think of a soccer ball too, though not always hexagons, those geometric shapes fit to a curved surface quite nicely. In your image, try creating smaller hexagons and they would get close to the actual shape of the polygon. Then try computing a rectangular/square grid over the same region with a similar width or height and you can see the difference. The hexagon is the most complex regular polygon that can fill a plane (without gaps or overlap). It is closer to a circle than the square in terms of shape, so you suffer less from orientation bias (lower anisotropy with hexagons) and it is more compact (lower shape index: perimeter²/area). It therefore provides more accurate sampling. The "length of contact" is the same on each side (with a square, the neighbours include the four squares at the corners). EDIT: As mentioned by @Jason, the distance between centroids is also the same in all six directions. On the contrary, distance to neighbours at the corner of square cells is multiplied by a factor sqrt(2). there are six adjacent neighbours instead of eight with the square (if you account for the corners). This would reduce the precision of a connectivity analysis. most importantly, you cannot subdivide hexagons to upscale or downscale your sampling with hexagon (with square, it is easy to aggregate or split to new squares). Square are therefore better for hierarchical analysis. In your case, there is another drawback because you want to partition a raster. Indeed, raster cells are square-based as is the raster extent. So, if you try to partition a raster using hexagon, it will not be possible to avoid partially included pixels. You will therefore rely on some kind of resampling strategy which will affect the quality of your data. Furthermore, any clipped raster based on hexagon will result in a proportion of NoData pixels. A key disadvantage of grid squares is that the sample rate is substantially lower along the diagonal vectors to those of the four sides (Jasons point above). If you have some regular linear pattern to your data the orientation of the grid affects the effective sample rate of each context. For example if you have a series of ridges and valleys, orienting the grid along these might only sample the valley or the tops and thus the type of vegetation or fauna to be found. Some other angle relative to the valleys would give a shifting sample rate between high and low over the region. A good example of such a problematic vector in an aquatic might be tidal range, sea depth, undersea ridges an so forth. Obviously, the effect can be mitigated or exacerbated by choice of sampling resolution, but ideally the sample rate to variance ratio should be stable over space. Hexagons, being closer to a circle, are less likely to accidentally cause such variable sample rate bias. It represents connectivity in an uniform way, which is very important for Earth Science modeling. For example, ocean current model usually use hexagon grid to solve complex ODE/PDE equations. It could cover a sphere uniformly. Tradition latitude/longitude based grid system will cause significant spatial distortion at different location. Using a DGGS can perfectly solve this problem. Not the answer you're looking for? Browse other questions tagged polygon analysis sampling or ask your own question. What practices are available for modelling land suitability? What sampling tools are available in QGIS? How to computational efficiently check if there are any overlapping polygons in a group of polygons? QGIS point sampling tool really slow for polygons? Sampling one shapefile with polygons of another using R?